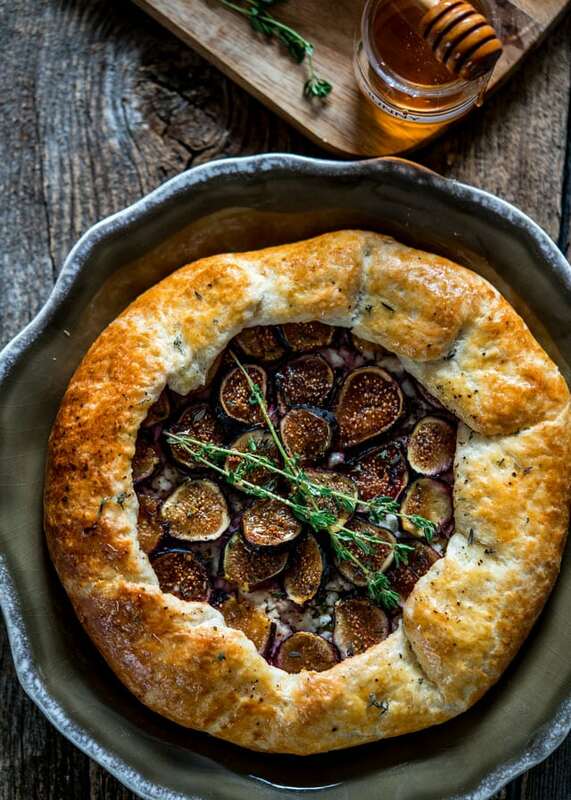 This savory Rustic Fig Galette with its flaky crust that just melts in your mouth, loaded with leeks, goat cheese, figs and drizzled with honey will surely get your taste buds dancing. 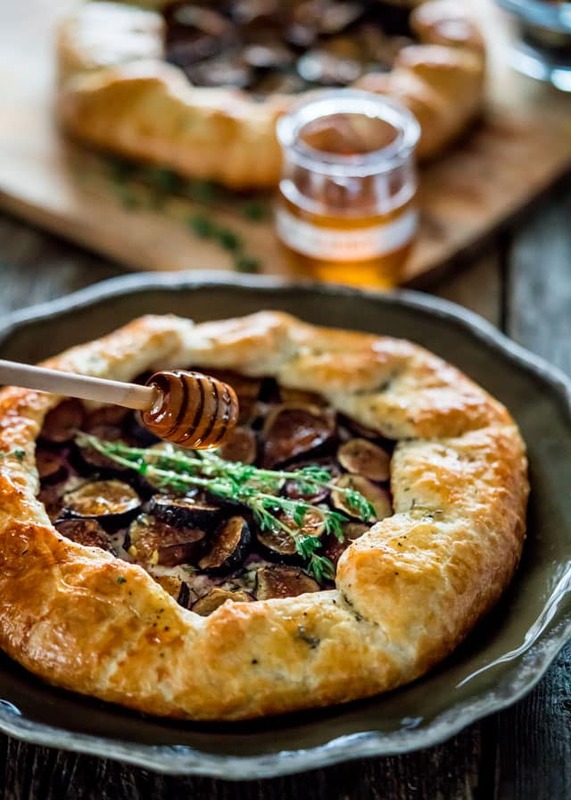 Being a food blogger, it’s not often that I make something or try something that blows my mind but that’s exactly what happened when I took a bite into this incredible galette. 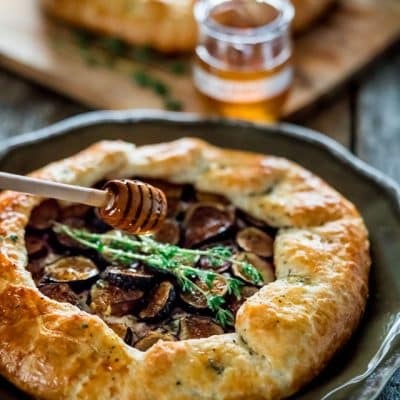 Every bite an explosion of flavors, you can taste absolutely everything that went into this galette, from the flaky crostata that simply melts in your mouth to the delicious leeks, the creamy salty goat cheese, to the sweet figs and honey. Who knew all these flavors when paired together could be so beautiful? The crust for the galette is the same recipe I use in all my galettes, why mess with something that works and has been tested over and over again, it really is a no fail crust. I did double my usual recipe here because I just knew that just one of these galettes was not going to be enough. A couple days ago we checked out this Italian market that I had never been to before. I was like a kid in a candy store, so many cheeses, so many pastas, everything was just incredible. I love finding markets like this, to see all those great products it’s quite inspiring. This is where I got these great figs and goat cheese, among many other great ingredients. But I just knew that I had to make something special with the figs because every year I look forward to this time of year when I can buy fresh figs and I never want to waste them. While I really just enjoy eating them drizzled with some honey or served with some goat cheese, I always want to try new recipes with them. 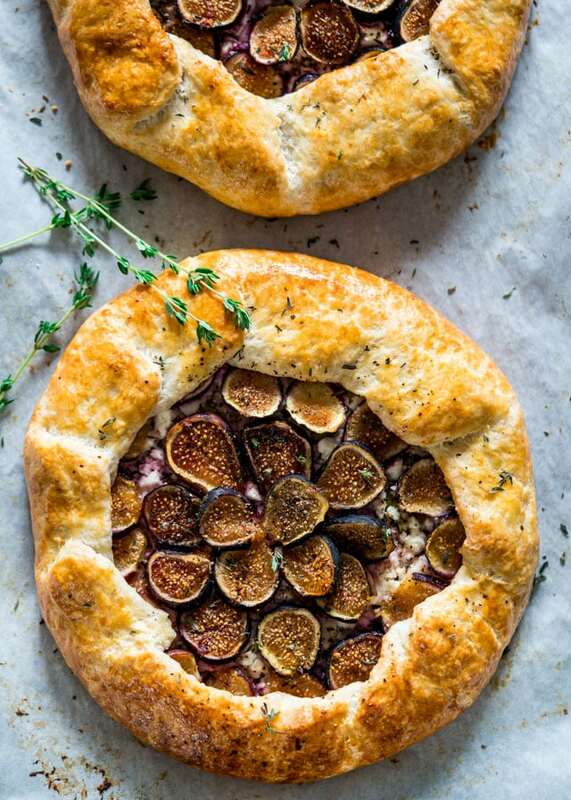 I was just going to do a galette with goat cheese and figs but then my friend Fenne had the brilliant idea of adding some leeks to it and what a difference it made! I for one, love leeks and think they are totally underused. They are great in quiches, stews and soups and taste almost like onions but have a much milder taste. Not to mention they are perfect for tarts or galettes. 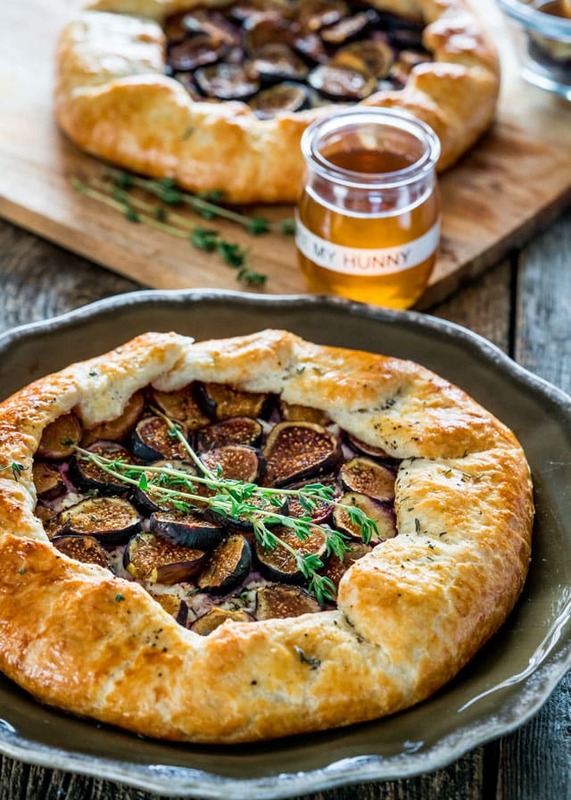 This fig galette is really the kind of food I love to make and serve to friends and family. Not only does it look gorgeous and not to mention totally impressive, but it truly is an explosion of flavors. I really hope you give this a try next time you find yourself with some figs and let me know how you like it, because I’m pretty darn sure you’re going to love it! In a food processor add the flour, sugar, salt and pulse to combine. Add the butter and pulse until the mixture resembles coarse meal. Add sour cream and the ice water and pulse until the dough just barely comes together. Gather the dough, divide it in two and pat it into two disks. Wrap the dough in plastic wrap and refrigerate until chilled, about 30 minutes. Preheat the oven to 425 F degrees. Line a large baking sheet with parchment paper. Heat the olive oil in a skillet then add the leeks and saute until they start to brown. Season the leeks generously with salt and pepper. Working on a lightly floured surface roll out a disk of dough to a 12 inch round; transfer to the baking sheet. Arrange half of the leeks in the center of the round, leaving about 1 1/2 inch border all around. Add about 1/2 of the crumbled goat cheese over the leeks, then arrange 1/2 of the figs all over the goat cheese. Sprinkle with a bit of ground pepper. 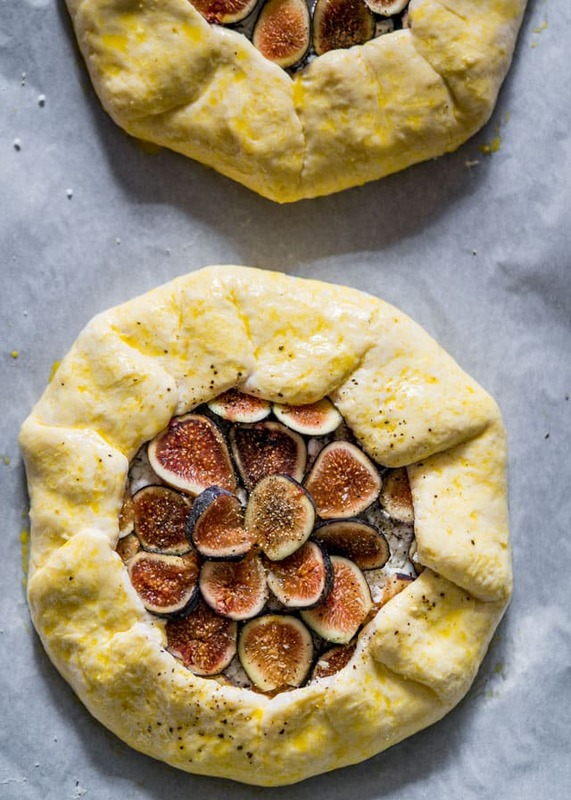 Fold the edge of the dough up and over the figs. Brush the rim of the dough with the egg wash. Repeat with remaining dough and ingredients. Bake the galettes for 45 minutes or until the crust is golden brown. Let the galette cool on the baking sheet for about 10 minutes then sprinkle with fresh thyme and drizzle with honey. Cut into wedges and serve. This recipe will yield 2 galettes. Green or white onion can be used instead of leeks. It's important to make sure you use cold butter so that your pastry ends up with a flaky texture. We made this galette over the weekend and it was amazing. What a wonderful recipe! Looks quite amazing, Jo! It’s definitely galette season. Can’t wait to dig into some excellent filled pastry. I had so much fun making this and it turned out so well. What was fun was I decided to add the leeks in which totally changed the taste. It’s a wonderful combination of sweet and savory and didn’t last the night. Let me know when you make it. Would love to hear your thoughts.